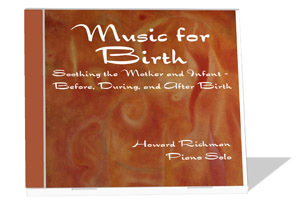 Transformational piano music to soothe mother and infant before, during and after childbirth. Music for Birth, from Sound Feelings, is a downloadable .mp3 or FLAC intended as adjunctive, supportive entrainment music to encourage relaxation and focusing for pregnancy and giving birth. This music is a helpful tool for natural childbirth, breast feeding, colic, newborn infants and nap time. It also provides a wonderful complement to midwifery and doulas. THIS BIRTHING HELPS GIVING BIRTH FOR CHILDBIRTH. ALSO LABOR, MIDWIFERY AND NATURAL CHILDBIRTH. MUSIC FOR BIRTH IS AN ADJUNCTIVE TECHNIQUE FOR ANXIETY, BABIES AND BABY BEDTIME. ALSO FOR BREAST-FEEDING OR BREAST FEEDING AND SOMETIMES BREASTFEEDING COLIC. DOULAS AND ENTRAINMENT MUSIC FOR FOCUSING INFANTS ON NAP TIME OR NAPTIME PAIN. PIANOS FOR PREGNANCY AND PREGNANT WOMAN OR RELAXATION. YOU WILL FIND RELAXING SOOTHING MOTHER AND INFANT. THESE SOUNDS OF SUPPORT ON TAPES AND TOOLS ARE TRANSFORMATIONAL MUSIC FROM HOWARD RICHMAN AT SOUND FEELINGS. A gentle rocking rhythm, along with peaceful harmonies create a secure, stable reference for comfort and support for the pregnant woman and preborn infant, the birth process, the newborn infant, and for breast-feeding. See the Uses and Applications for Music for Birth. Listening Suggestions for Music for Birth. Available INSTANTLY. After you make your payment, you will be given a password which will allow you to download the .mp3 or FLAC version of Music for Birth. You will then be able to hear the complete track on your computer. If you prefer, you may use your CD burner on your computer to burn a CD of the track, which you then will be able to play on any CD player. Please see our free tips on toddler-proofing your computer. Please see our Music for Children cassette. Also, please see our links to other great sites about childbirth, breastfeeding, pregnancy, insomnia, pain management, stress management, and sound healing.